One of my favourite cookery books is one by Ms. Mary Berry. Her recipes work every single time. This comes from an inherent knowledge of ingredients, a lifetime of cooking, and tried and tested recipes. 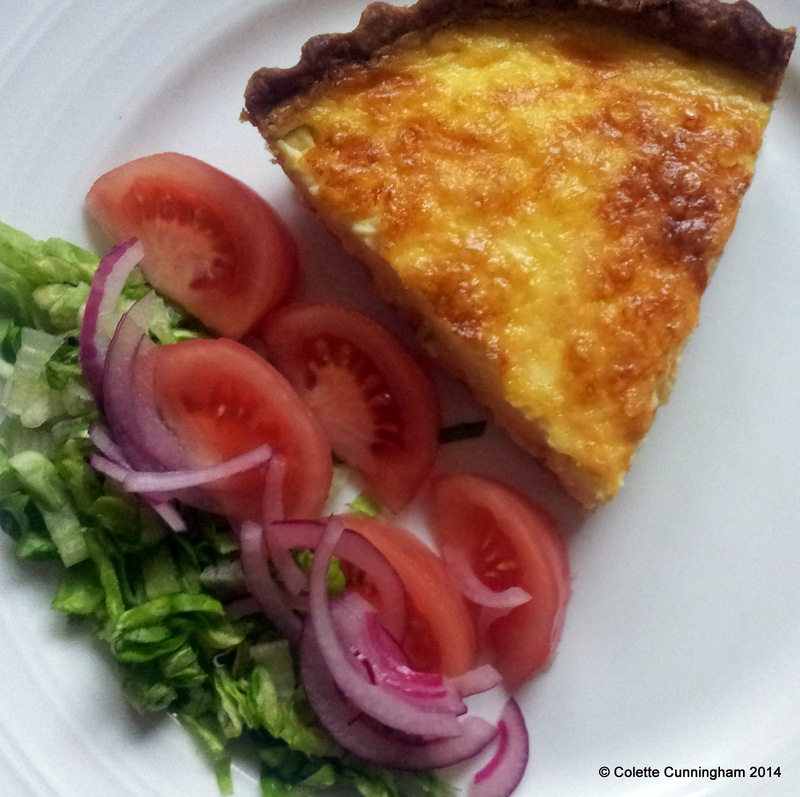 Her Quiche Lorraine is just one of those recipes. I have made it, time and again, switching up the cheese and bacon she suggests, and also substituting a portion of the cream element with some crème fraîche, to suit my own taste. If you have a copy of this book in your collection, this Quiche recipe is on Page 88. I use Ms. Berry’s pastry recipe and blind baking method. It makes a very crisp pastry as a vehicle to carry the liquid filling. She uses 6 oz of plain flour with 3 oz of cold, cubed butter… (I use unsalted), You can also add a few grams of Parmesan cheese. Use a micro-plane to grate it in. In a food-processor, blitz to a breadcrumb consistency. Bring it together into a dough with the addition of 3 tablespoons of water, which you add slowly. When it forms a ball, take it out. Roll out your pastry to fit it into your tin. (I use an 8″ fluted, loose base tin). Then, take your rolling-pin, and run it over the surface of the tin, to cut off the overhanging pastry. Cover with cling-film and pop in the fridge until you are ready to use it. This will prevent your pastry from shrinking during baking. When you are ready to bake the pastry case, set your oven to at least Gas Mark 5, 375° F, /190° C, take the pastry case out of the fridge, and, using a fork, prick the surface all over, to prevent the surface from rising. Take a sheet of baking paper, enough to cover and overhang the surface of your pastry. Scrunch this up in your hands (it will fit the tin more easily). Spread this over your pastry shell, and cover with baking beans, rice or similar. Bake for 15 minutes, remove the paper and beans, and bake for a further 10 minutes, to dry out and cook the rest of the shell. Leave to cool, in the tin, on a wire baking rack. Turn the oven down to Gas Mark 4, 350° F,180°C. Approximately 4 or 5 oz. of cheese, choose your favourite. I recommend a good Cheddar. Place the eggs, cream and crème fraîche in a jug or bowl, give this a whisk, and set aside. Fry off the bacon in a dry pan, until sizzling and, golden. Take this out and scatter on to your cooled pastry case. Next, use the same pan to sauté the chopped onion. Add the cheese, then pour over your egg, cream and crème fraîche mixture. Bake for 25 -30 minutes, until set. Take it out of the oven and leave to cool in the tin for 10 minutes. Remove and leave to cool a little before eating. A light lunch or supper, depending on your appetite, or a dinner idea, perhaps accompanied by some home-made potato wedges, or chips. Lovely quiche indeed. I could do with some salad now, having been overeating of late.